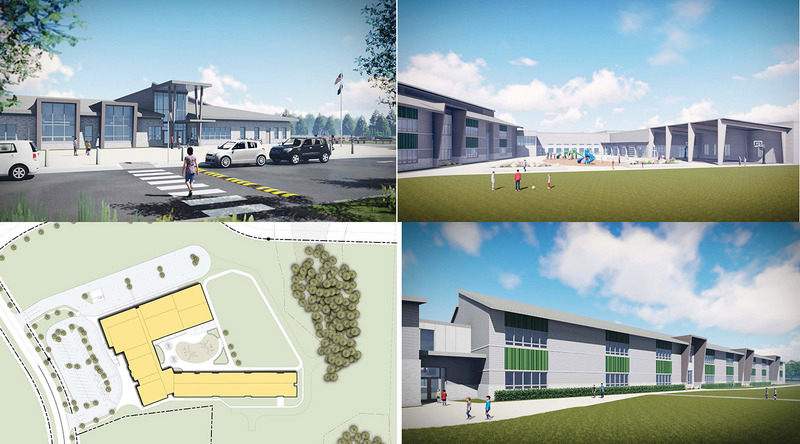 After passing the bond measure to construct new schools and additions and make renovations, the design process has been in full swing. District staff, the School Board and community members on the Bond Oversight Committee, have participated in a series of planning sessions to discuss timelines, site plans and designs. The following is an update of progress to date. Find more information on the bond information section on the website. Design continues for the new elementary school. Groundbreaking will begin this summer. The building will open in Fall 2019. 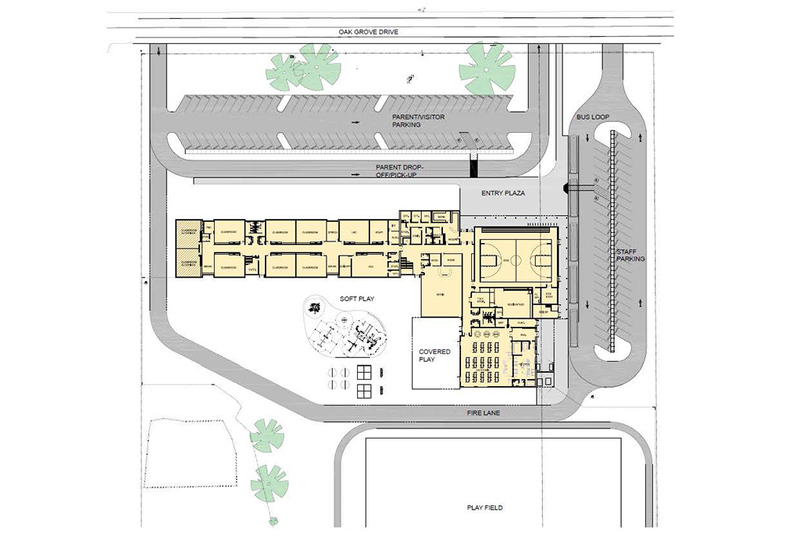 The school is being bid as both a 500-student school and a 600-student school; the School Board hopes to be able to build the school with the larger capacity (the drawings below depict the 600-student school). This school will be immediately north of Timber Ridge School. The Oak Grove bond project began as a modernization of the existing building with a 44,000 Square Foot addition. The gym and most of the building would have been salvaged while the remaining part of the building would have been torn down and rebuilt. After further study, it was determined that the existing gym was not large enough and/or not properly located to serve as either a gym or a cafeteria in the remolded school layout. A new cafeteria was part of the addition. In addition, the estimated costs for expanding the existing gym was prohibitive. With the additional bond dollars that resulted from the bond sale, a revised layout was designed that retained less of the existing building and added a new gym and cafeteria. During the cost estimating phase the estimators asked why we were trying to maintain the existing building as they believed it would not cost anything more to tear it down and start from scratch. Further work concluded that for an additional cost of about $160,000, a brand new school could be constructed. There are many reasons that this plan is more efficient: longer building life expectancy, a school on a single grade (no ramps needed in the school), a more compact design that shortens distances around the school, cheaper to maintain, and an improved parking and vehicle circulation plan. On Nov. 6, 2017, the School Board formally opted for the new school construction option. This school will be bid as both a 400-student school and a 500-student school. The school board hopes to be able to build the school with the larger capacity. The drawings below depict the 500-student size. This decision will require that the approximately 280 students who would have attended Oak Grove next year will need to be rehoused for one school year. That plan is being devised and is expected to be announced in February. Here is a conceptual plan of how the new school will be laid out on the site. 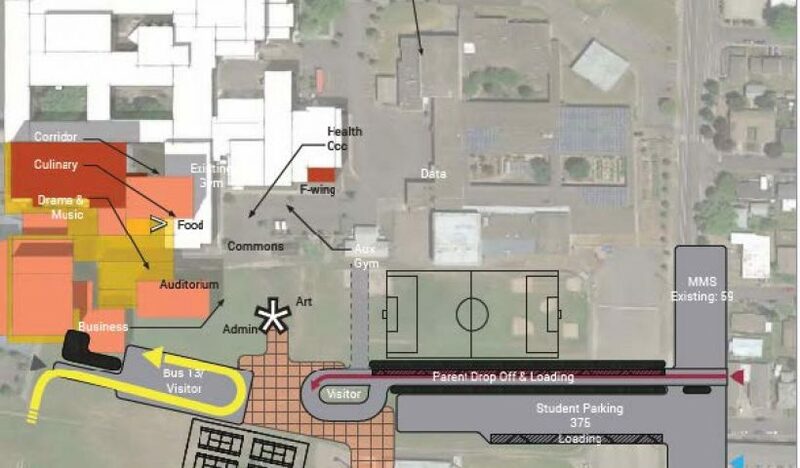 Work will begin this summer at South Albany High School, including new instructional space in the existing gymnasium building (Building 10). The projects include adding CTE classrooms. Directly adjacent to the west will be a new building housing an additional CTE classroom and a large multi-purpose space that can be used for both physical education and CTE lessons. An added benefit of this project is the ability to significantly improve the inadequate lobby and restroom situation of the current main gymnasium. The space will be shared by the two buildings. There is also planned a major overall and renovation of Building 4, transforming it into modern CTE space for students. This space will include a new maker lab, a new fabrication lab, new computer lad, renovated metals lab, and a covered courtyard for construction projects. Lastly there will be some improvements to the interior of Building 8 to make the space more functional for performing arts. These drawing are subject to change. Big changes are in store at our middle schools and their CTE space. Work will commence as soon as school ends with ribbon cutting planned for late August at all our middle schools (except that NAMS may be delayed one year depending on the outcome of where to house next year’s Oak grove students). New maker labs, new fabrication labs, improved wood shops, and improved culinary art spaces are all examples of the work on tap. As an aside, the locker rooms at the three older schools will also be receiving long overdue rehabilitation. 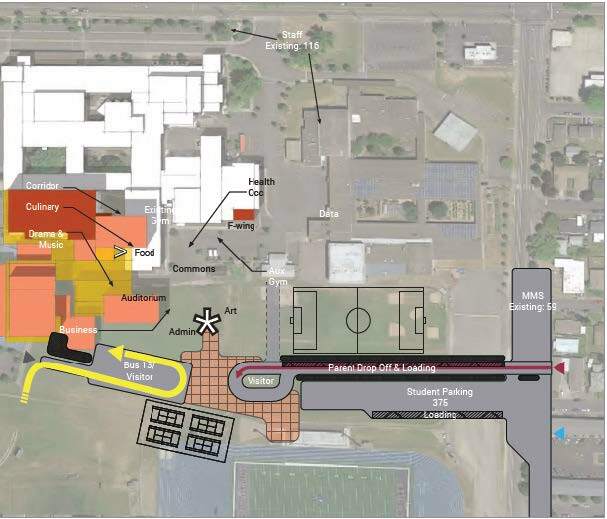 The single largest project in the bond is phase one of an eventual new West Albany High School. Because of the magnitude of this project, the design is not as far along as the other school projects. The team has to decide what will be built now and how phase one will work within the eventual complete campus. The first phase will include new CTE spaces for maker spaces, video production, digital audio, health occupations, and art studios, choir, band, and drama classrooms, an auditorium, cafeteria, administration, commons, and potentially a multi-purpose space used by physical education and CTE programs.